When attempting to resolve an international or internal conflict, one of the most important elements is to remember that sovereignty needs to be respected. All sides need to feel that their authority and power are respected and that they are being heard. It is essential to ensure that all resolution processes are broadly inclusive. Different conflicts will require different methods, depending on whether the conflict is ongoing or the society is experiencing tensions post-conflict. The most ineffective approach is to employ a “one type fits all” model; unfortunately, such an approach has been typical of many peacebuilding operations, according to Krishna Kumar, a senior social scientist for the Department of State. The process also must evolve as the conflict evolves. 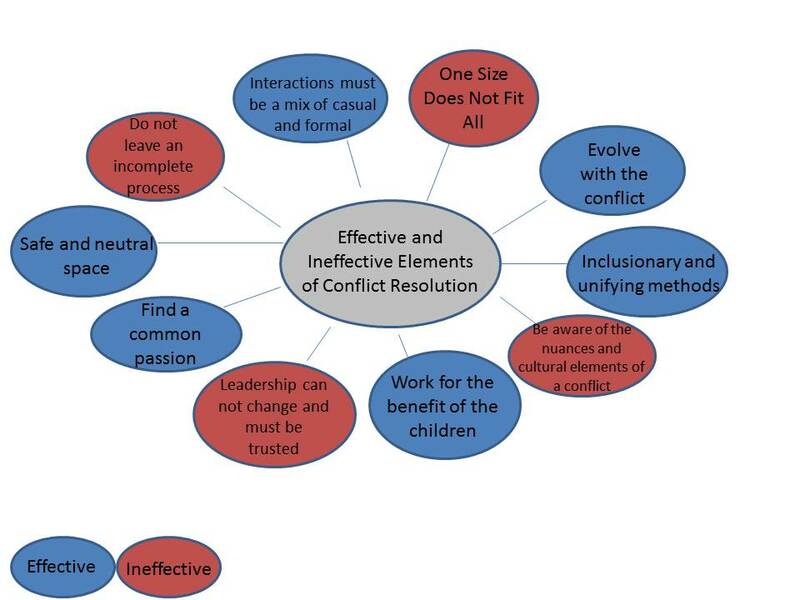 An unusual conflict resolution initiative is most likely to be effective if it occupies a specific niche in the conflict, focusing on one element and expanding out from there. As with the Peace Players of Northern Ireland, it is most effective to have a framework from which to launch the conflict resolution process, using basic mediation concepts and skills, and then targeted programs, which the Peace Players founded on their three core elements. In track-two diplomacy, targeted programs can be particularly helpful, according to a professor at the University of New Zealand, Jacob Bercovitch, who wrote “Conflict Resolution in the Twenty-First Century.” Especially where identity issues such as religion or ethnicity are factors in conflicts, a “solidly based but flexible operational plan” often works best, Bercovitch writes. Another pattern that emerged is the willingness of conflicting groups or states to work together when it benefits their children. Whether it involves educational materials, schooling, or activities that get the children away from the conflict, usually adults on both sides are supportive. It is rare to find adults who are willing to look past their hatred and distrust of their enemy for their own sake, but it is more common for them to do so for their children. Many parents understand that educational failure is one of the largest problems in conflicts today and so they try to encourage any educational opportunity for their children, according to UNESCO Programme Specialist Patrick Montjourides in his article “Education Data in Conflict-Affected Countries: The Fifth Failure?” However, using children to positively impact a conflict can lead to a long delay in judging the effectiveness of the programs. Another essential element of effective conflict resolution methods is the use of a safe and neutral space, where none of the parties involved feels threatened. The parties must feel that they can freely express themselves without fear and without committing to an outcome, according to Matthew Billings and Leon A. Watts in their article “A Safe Space to Vent: Conciliation and Conflict in Distributed Teams.” Often, the level of distrust between conflicting parties is so great that neither would be willing to work with the other on their own territory. This is a long-standing principle of conflict resolution of all forms. The success of this approach is evident in the wilderness retreats of Outward Bound. The idea of a safe and neutral space represents the underlying concept of trust in a negotiation or diplomatic setting. Without building trust between the conflicting parties and between the parties and a third-party mediator, there is no hope for conflict resolution. Trust can come from any common bond or any act of good faith. It can come from a mutual trust of a mediator. Mediators need to be non-threatening and, if possible, be able to immediately relate to the conflict, as did the two Zulu leaders who visited Burundi. However, when selecting a mediator, it is important to recognize when conflicting parties can no longer mediate between themselves and require a third-party. If a third party is to be involved, having a common language is crucial. In Burundi, translators were needed and many important nuances were left unresolved. The mediator/leadership should not be changed during the process. In Burundi, the changing mediators resulted in minimal trust or respect of the mediator from both sides. Acknowledging cultural elements and political nuances of a conflict can play an essential part in any successful conflict resolution. A major problem in wars such as the Vietnam War or the Iraq war was the lack of knowledge of the cultural differences between the parties involved in the wars, and that led to a prolonged conflict, according to Dan Nowicki, journalist for the Arizona Republic, in his article “10 Years Later, Many see Iraq as Costly Mistake.” In the process of “basketball diplomacy” to North Korea, the most ineffective aspect was Dennis Rodman’s denial of the political implications of his actions. With the New York Philharmonic, the same claims were made. Since these two cases have the potential to unite two politically alienated countries, the political aspects of the cases must not be disregarded. The program stagnates when the political aspects go unacknowledged. The conflict parties must be ready to participate in the process. Otherwise, this could lead to an “incomplete” peace process, such as the one in Burundi. It is important always to incorporate the wishes of the people and respect for human rights into an unusual conflict resolution process; the point of peacemaking is to alleviate their sufferings during a conflict. Some method of enforcing the conflict resolution agreement also can be effective. In Burundi, the weak peacekeeping force made it extremely difficult to sustain progress. However, enforcement does not always require peacekeeping forces in order to be effective; it also can stem from a strong desire for peace from all parties involved in the conflict.